Madhya Pradesh state government has started a new online portal to record the monthly complaint of general citizens. This portal has launched to help people lodge their reports with government. The online portal for complaint has been launched this year in the month of August. In the year 2014, CM has launched the helpline 181 for the citizens of the state. It was a 24×7 helpline number where people could call and lodge any complain. Through online complaint application form one can lodge his / her complaint with the website. One can lodge complaint or grievance against anyone related to government. Also they can directly complaint to the CM of the state. There will be a fixed day to take and consider the complaints on the website. It has been decided that on first Tuesday of every month the complaints will be collected and discussed. The portal has launched to take immediate action on emergency as well as non-emergency things. Nearly 20 -25 complaints will be collected and considered in a single meeting. According to Mr. Chauhan this will lead to more accurate and faster action than before. This portal will fix / solve your problems through online only. One does not need to run from one office to another for the solution. They can now get every answer on the portal itself. To register online complain the applicant must click on the following link http://cmhelpline.mp.gov.in/Public/OnlineComplaint.aspx?type=hi%3b. This link will take the citizen to the complaint application form. There are two parts in the application form. First part has the basic details and the second part has complaint details. In the first part add your name, mobile number, email ID, aadhaar card number, nick name, address, and district and block details along with Gram Panchayet details. In the second part enter the complaint details. Starting with the whether you are from rural or urban areas, then add the department, district and category of the complaint. Also include the brief detail about the issue. One can also upload scan copies of respective papers if there is any. Click on the blue tab ‘Enter public complaint’ after providing all the details in the complaint application form. Once you click on the tab, a complaint lodge number will be generated. That will be sent to your registered mobile number. Keep that number for future reference. Along with lodging a complaint one can also give suggestion or advice to the MP state government on any particular issue. 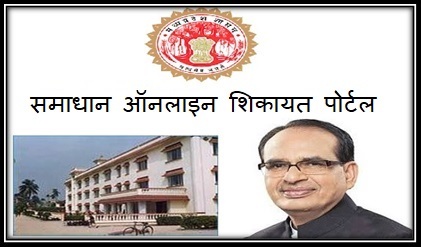 To register the demand/suggestion click on the following link http://cmhelpline.mp.gov.in/Public/Demands.aspx. In the page you will get an application form exactly like the complaint registration form. The form is divided into two parts. One is for the basic details of the applicant and the other one is for the demand/suggestion. The first part is similar like the complaint form. In the second part choose the area, urban or rural. Then chose the district and select the option from the list whether you are demanding something or providing an advice. Finally after providing a brief detail of either demand or suggestion you can click on the ‘enter demand/suggestion’ tab, afterwards your demand/suggestion ID will be generated and sent to your phone number. The status of your complaint can be tracked through the link http://samadhan.mp.gov.in/CP_grevience_search.aspx. Enter the generated complaint number or your mobile number and click on the search button to know the status of your complaint. This portal will be an integrated platform to listen to every kind of problems citizens of the state is facing at this moment. With this portal the complaints will be solved faster and properly than before. Recently, Chief Minister Shri Shivraj Singh Chouhan has reviewed ‘Samadhan Ek Din Yojana’ and has suggested for a quick solution of the problem including public services. Further, during July, approximately 1.10 lakh applications have been disposed of, and this is a great achievement. Besides, under the scheme, 6.65 lakh service opportunities have been created. Mr. Chouhan has congratulated officers working in this scheme and has complained strictly of the ones who have given poor performance in the same. Also, he has shown discontent about the Tribal Welfare Department who is dealing with problems pertaining to collegiate classes.